Our ”kveldsmat”/pre-bedtime snack family conversation turned to the topic of the new baby. More specifically, what we should call the new baby. Karel has been an active participant in this topic before and has set some strict guidelines. 1) The baby cannot be called something that anyone in the rest of the world is called. No repeat names. 2) He has to like it. So far, none of the names Bjørn or I have suggested have fulfilled either criteria. Our firstborn is closer to five than he is to four now, but don’t mention that to him. He doesn’t want to grow up. I’m okay with that. But he IS growing up. He’s learning things — words, play, behaviors — from sources outside the house. He’s confused when others act unfairly, upset by conflict, learning to be empathetic. I think both Bjørn and I flash back to our own four-, five-, six-year old selves when we watch Karel learn to navigate social ins-and-outs as a borderline introvert. So this evening at the table, when our little grown-up suddenly said ”I’ve got it!” after rejecting every name suggestion we came up with, we waited to hear what his undoubtedly brilliant suggestion would be. ”We can take ‘Karel’ and ‘Emil Birk’ and put them together for a name for the baby,” with a finger emphasizing the sounds of names. We’ve been working a bit with letters and phonetics, and I feel fairly certain he was visualizing letters and trying to put them together, like they do on one of his favorite t.v. programs. Eyes under raised brows meet across the table. Ohhhhkay. Silence it is. But the seriousness on his little face; the energy going into just thinking, idea generating… Our eyes became a bit shiny. Closer to five than to four. Closer to school than to daycare. I missed something in what was said next by Emil Birk, something that prompted Karel to ask me half-seriously if I was their mama. Wide blue eyes, shaking blonde head. And then we told him, Bjørn and I, about the night before he was born, when I had to go into another room while Pappa and Grandma were watching a movie (the brilliant La Misma Luna) and the contractions became too strong to ignore. About how at the hospital I felt him flip and flurry inside me into new position, and then it didn’t hurt as badly. About how I was concentrating so hard on pushing that I didn’t even know he’d come out. Pappa had to tell me to look, Kim, here he is, it’s a boy!. And our sentimental reminiscings shifted into gut laughter. ‘Cuz everything happens so fast with kids. Today it was seeing each perfect, tiny little vertebra in our baby’s back. I don’t think I will ever get over the marvel of an ultrasound. Showing me, inside me, what this little life is up to. Reassuring us that so far, so far, everything looks fine. Looked better than fine to me — ”s/he’s perfect,” I kept thinking. I don’t know why it was so dramatic this time around; maybe even though I think about this baby a lot, it’s sometimes laced with insecurity over my ability to take care of another one. (Seriously, Emil Birk wakes up wrestling with Karel.) But seeing her face, a tiny thumb pointing up saying ”it’s all good, mama,” a leg squirming away from the waves of the ultrasound; felt a lot like those minutes after birth, when you just know that it’s going to be fine because your baby is fine. Better than fine, actually. As close to perfect as one can get on this side. So that was a definite bright spot in this week of single-parenting. And great to confirm how many babes are in there, a matter I’ve spent WAY too much time googling in the last months. The boys are ready for pappa to come home, I think. Their differences have been highlighted in the last few days, especially in the mornings and evenings. You know, when we actually need to get somewhere. Like bed. Emil goes into hyper-crazy-whirlwind mode, which CAN be funny when it involves cheerleader stances and enthusiasm for random food items (”PINE- APPLE!!! PINE- APPLE!!! ), but is NOT funny when it involves refusing to lie still in bed. Karel, on the other hand reverts to deaf turtle mode. Meaning a decreased capacity to hear instructions and total incapacity to follow through on those instructions once they DO penetrate. There is something about taking 20 minutes to wash hands that makes me crazy. I’m sure that there is some very calm, collected way to embrace their individuals styles and channel them into the directions I’d like them to go, but I just haven’t stumbled upon that little zen pocket of understanding yet. Gotta go. 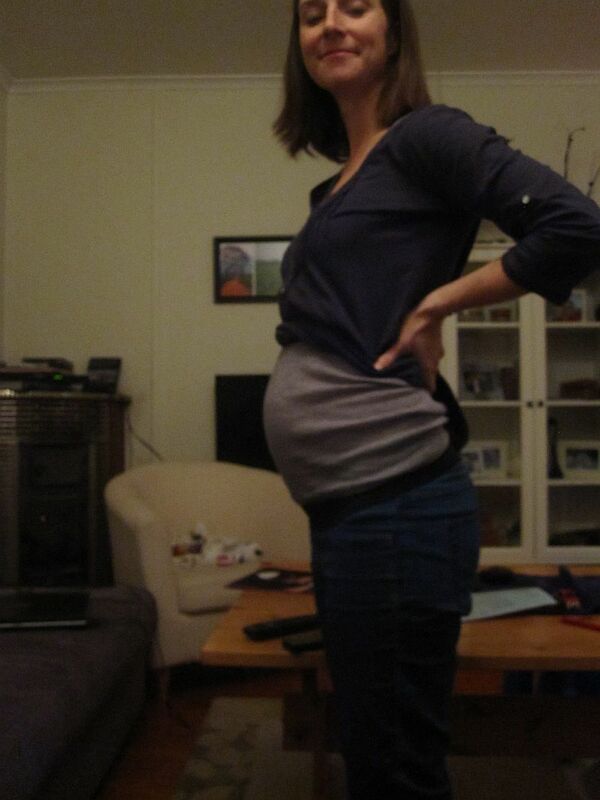 Here’s a pic of belly just shy of 20 weeks — late at night, after a plate of nachos. 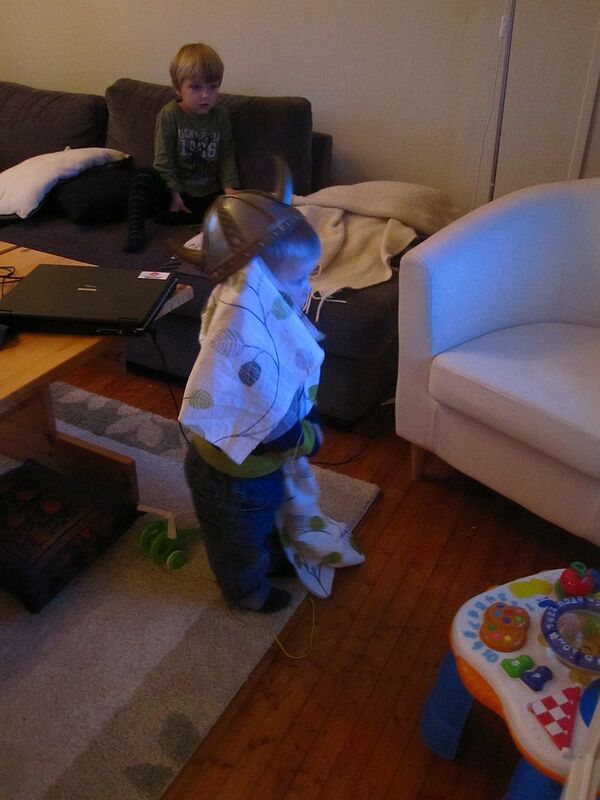 And one of Emilian who likes to put things on his head.